Siberian larch is very resinous and extremely hard wearing, making it one of the toughest and most durable softwoods in the world. 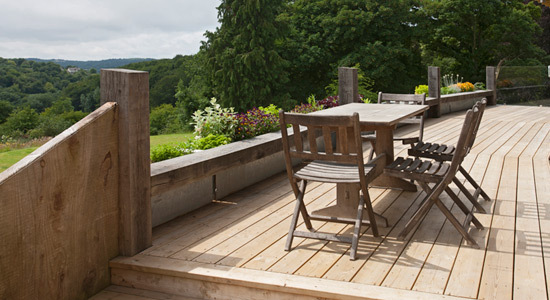 For these reasons the timber makes excellent decking for both residential and commercial projects. Siberian larch has long been a very popular construction material in Europe but only recently has it found such popularity in the UK. Not to be confused with the larch grown in Western Europe, which is pink in colour with dark brown knots, Siberian larch is ideal for those designing on a budget but wanting a superior quality decking as it is approximately half the price of oak and performs almost as well. Although Siberian larch is similar in colour and appearance to pine, it is far superior in all aspects of performance and can be used externally without any chemical treatment. Weathering As the boards weather, the colour will change to a silver-grey. Larch is quite consistent and is not reactive, and as such, will weather relatively evenly. Northerly elevations may weather to a darker grey than those facing South.